It had been while photographing her dearest friend and mate, Lionheart, that the Dragon Princess discovered the secret chamber in the Throne Room of Seerus. Set behind a false wall and covered by a hanging tapestry, it was well hidden. The Dragon Princess unsheathed her side blade and used it to carefully move the tapestry aside so that they could peer inside. For a hidden room, it was quite large, lit only by the phosphorous glow of weapons and vials. They moved inside for a closer of examination of the amazing weaponry inside. The weapons consisted mainly of a variety of bombs and missiles, the likes of which they had never seen. Lionheart and the Dragon Princess were quickly surrounded and completely outnumbered by gremlins warriors. “Watch your tongue, little missy, or I’ll have it out now,” growled Seerus as he took a heavy step forward. The Dragon Princess spat a smoky fireball in Seerus’s direction. “I am the Dragon Princess and this is Lionheart the Brave. We’ll strike no bargains with the likes of you!” she hissed. At the mention of their names, jeers and arguments broke out amongst the gathered gremlins. These were no two ordinary knights they were facing, but rather highly decorated Vanguard knights of royal bearing, weaponry and skill. The very tall Lionheart had on a shadowy Snarbolax Coat which had been alchemized with triple max unique variants. Attached to the back were Shadow Valkyrie wings, giving him the appearance of an angel of death. His Twilight Aura and glowing red eyes further accented his imposing and deadly presence. He tightened his grip on his exceptionally powerful Glacius. His companion, the Dragon Princess, stood in poised contrast. Lionheart with his very tall height stood a full head above the shorter Princess. Where he was darkness and ice, she was bright shining and fiery. Her Sunshine Aura sparkled off her golden Radiant Silvermail with her Regal Wings. She was crowned with a Golden Wreath and Volcanic Halo. Her maximum charged Combuster sword glowed red hot in anticipation of battle. At his joke, a roar of howling laughter broke out. That was the last sound they heard before falling unconscious to the floor. The Dragon Princess returned to consciousness to find herself in a dungeon where they were bound in heavy in chains. When the guards noticed that they were both awake, they sent word to Seerus. When the hulking weapons master appeared at the cell door, the Dragon Princess hissed at him and pulled at her chains. “It’s no use, Princess. I’ve been pulling at them quite a bit already, and there is no give in them” Lionheart said with anger and discouragement in his voice. “I follow you just fine, demon-gremlin. Have on with it,” she retorted. “Good, ‘n fair enough. Well, you’ll be attendin’ this festival disguised as one of my workers, the difference bein’ you’ll have a special firework bomb attached to your back and affixed to your knight’s life-energy at the wrist along with a switch. You’ll use this spectacularly destructive bomb I’ve created against the fiends during the peak of their festival. This bomb, when ignited by you, will end the miserable existence of every one of those fiends in attendance.” Seerus laughed with evil humor. “I don’t suppose you bothered to put a timer on this bomb?” inquired the Dragon Princess. The gremlin horde laughed loudly and cheered the Dragon Princess’s upcoming demise. “So it’s a suicide mission, is it? And if I refuse?” snorted the Dragon Princess with a puff of fire and smoke, baring her teeth and twitching her tail menacingly. “How do I know you won’t just slay Lionheart anyway?” asked the Dragon Princess. “Why, you have my word as the Weapons Master that I’ll release him unharmed. What you don’t have, Sweets, is a choice.” At this, Seerus and his gremlin guards roared with mirthless pleasure. A week later the Dragon Princess disguised as a gremlin worker, was in attendance at the Pyromantic Festival. The suicide bomb was strapped to her back like a shield in a way she could not reach or remove, with a wire leading to a switch around her wrist. The whole design was especially attuned to a knight’s life-energy so that only a knight could set it off, not a gremlin or fiend. She had not seen Lionheart since they had said a brief and final farewell in Seerus’s dungeon. She deeply regretted that they would have no more time together, but took some comfort in knowing that in giving her life, she would spare his and inflict huge casualties on their enemies while doing so. The fiends were at the height of their celebrations, with fireworks filling the skies and drunken revelry going on all around her. Some had already found mates and wandered off from the celebrations. Most, however, were still gathered around the main events. The best time to use the bomb in order to inflict maximum casualties was now. With her death only minutes away, the Dragon Princess said a final prayer of spiritual peace as she moved toward the center of the festivities. In these final moments she thought once more of Lionheart and hoped that Seerus would keep his word to spare his life. Just then she was seized around the waist, lifted off her feet and carried off behind some crates. Before she knew what was happening, the bomb was stripped from her back without breaking the bomb-to-knight life-energy connection and transferred to her abductor. As soon as she was released, she immediately reached for her dagger, but her wrist was caught in a firm and somehow familiar grip. It was then that she finally got a look at who it was. She looked at his armor and could see that he had been in a fierce battle and was badly wounded. His Snarbolax Coat, which allowed him to blend in so well with the shadows, had been heavily shredded and bloodstained, and his Shadowy Valkyrie wings were beyond any hope of repair. The Dragon Princess had lost her bearings in the swiftness of events and followed Lionheart’s lead to an elevator and possible escape route. He collapsed heavily beside it and she sat next to him. “Lionheart, you’re amazing. Let’s get that bomb off you and get you to a healing center right away!” the Dragon Princess said excitedly, and took him by the arm to get him up. “If only we could, but that’s just not possible,” said Lionheart with a voice so low it could barely be heard over the partying around them, yet the Dragon Princess could detect more than physical pain behind his words. “My wounds are, mmph, too severe this time, precious one.” Lionheart was breathing heavily as he lay beside the elevator. “With all my heart, I wish we had more time together, but it is not to be. And now, before you are caught . . .” He rose up and drew her to himself and kissed her for what would be the final time, taking her breath away with his passion and the fierceness of his hug. Before she could recover, he gave her a gentle but firm push onto the elevator and hit the “up” button, sealing her inside it. “Lionheart! Lionheart!,” she screamed. She reached for him through the elevator gates, and their gloved fingers brushed as it began to take her upward. Tears blurred her eyes and she wiped them away so that she could get a clear last look at the one who meant so much to her. His glowing red eyes and upraised hand were the last sights she ever saw of him. She reached the planet surface and moments later a tremendous blast shook the ground. She knew what it was and what it signified, and she collapsed to the ground weeping. In those moments of unbearable grief, she swore that Lionheart’s sacrifice would be known and remembered forever. The loss of Lionheart was felt far and wide amongst the Spiral Knights. All agreed that Lionheart’s sacrifice should be appropriately honored. Many of the foremost knights gathered in a special council to decide how best to do this. During this emotional time for the Dragon Princess, she always made sure to set off some memorial Pyromantic fireworks in Lionheart’s name. And each time she gazed into the sky at their fiery beauty, she made sure to say a prayer of thanksgiving for the knight she had loved and who had forever changed her life and the lives of so many others in Spiral Knights. The end began with the opening of the Core. The goal we knights had sought as our hoped for salvation instead became the source of our demise. In retrospect, we should have known better, for the Shadow Lairs had given us glimpses of the dark, stun-inducing, vampiric creatures that hid and preyed upon us in the dark hot depths of the Core. The Swarm . . . the swarm . . . so aptly named for the sheer numbers of mixed monsters that had oozed from the Core like toxic lava in endless waves of doom and death. Most of us knights perished fairly quickly. Some of the more powerful and uniquely skilled knights were able to withstand the onslaught long enough to band together and flee to Sanctuaries. A few of us, like myself, found unlikely allies amongst our former enemies. But what none of us realized at the time – neither knight nor monster – was that the energy in the Core had been the main source of heat for the planet internally and externally. Once the Core had been breached, that heat began to dissipate. WINTER – brutal and unforgiving - had come upon us all, friend and foe alike. No longer did knights and monsters battle one another. Instead, we all fought merely to survive long enough to hopefully one day thrive again. Alliances that were once unthinkable were formed, as well as friendships and sometimes more. And thus it was that offspring were born to us who were neither knight nor monster but rather a hybrid of the best of both. Mixed breed though they were, they brought a purity and peace to the planet – and hope – hope that this mysterious, dreadful, wonderful Spiral World might finally become something that it had never truly been before – HOME. 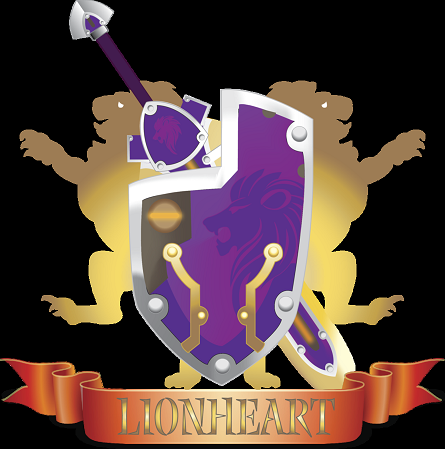 Great story for the origins of the Lionheart guild! I was thinking, should it be added to the guild wiki page? 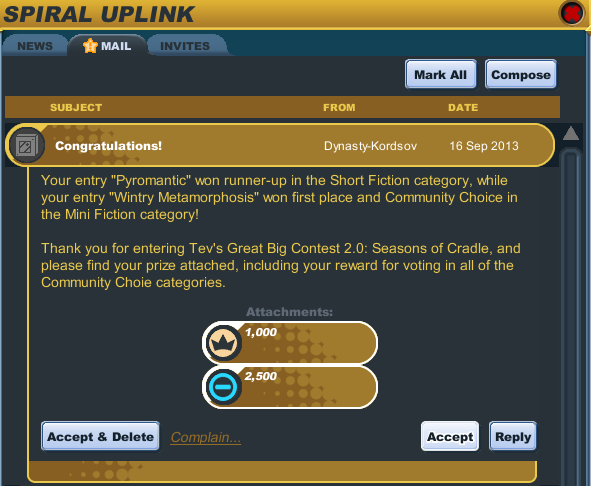 Oh yeah, congrats for winning in the competition!